An in-depth exploration of Hawaii’s Big Island. RAID’s Brad Sauber has spent more than 10-years leading cycling & hiking tours through this amazing landscape, over its volcanoes and along it’s stunning beaches. Join us in this New Year while we circumnavigate the Big Island and seek to find it’s Aloha. The Big Island is nearly the size of Los Angeles county with two mountains almost 14,000 feet high with a population of 150,000 people. A place every bit as desert-dry on the leeward side as L.A., but with drenching rain-forest jungle around the windward bend. A place as touristy along one strip but which retains elsewhere an appealing idiosyncratic vibe. Lapped by tropical water, and with peaks high enough to hold snow, it is a funky hybrid where the locals blend Japanese cuisine with Spam, and really do give you, many times a day, the thumb-and-pinkie shaka wave. For the cyclists, it’s perfect! If you crave vertical, there are brutal ascents galore. If you want variety, there are 11 climatic zones, which is one of those tourist-brochure claims that is hard to process but means that the island is a fantastic quick-change artist. Here you see a vista hinting of Scotland, there one like Bali, here Brazil, there Iceland, here a jungle chasm, there a micro desert. Along the way hippies, cowboys, Hawaiian old-timers and recent, gung-ho emigres-plus the global nomads who wind up on the warm sandy fringes of the world. And the Big Island has paved back roads galore! For this classic Raid, we will be circumnavigating the island on two wheels, all the way around this behemoth of an island. After our daily rides we can snorkel, tour a coffee farm or kill time at a beach resort. Don’t miss swimming with the green sea turtles or sampling the tropical smoothies at What’s Shakin’. Ironman athletes come from all over the world to test themselves against the heat and wind of the Big Island, this morning we will try our hand at the famous Ironman course heading to the northernmost tip of Hawaii. Keep an eye out for the wild donkeys, sweeping ocean views and for your first glance at the 13,600’ foot Mauna Kea volcano along our route. Once we turn the corner on Hwy 270, keep an eye out for the stunning views of Maui and Haleakalā in the distance while the black lava landscapes give way to the flourishing, green pastures of North Kohala. We come to the end of today’s ride with an inspiring view of the verdant cliffs from the Polulu Valley Overlook. Tonight, we stay at the quaint Kohala Village Inn and we will dine at one of the oldest and most beloved restaurants on the island, known for its creative Pacific Rim menu and aloha spirit. Following a hot cup of Kona coffee, we begin our ride this morning with a steep 3,000 foot-climb deep into the lush Kohala mountains. After passing through ranch land and Eucalyptus lined roads we descend quickly into the upcountry town of Waimea. From here we continue through the Parker Ranch via the Old Mamalahoa Highway, a narrow, sweeping one-lane road that descends to the old sugar cane plantation towards Honokaa. We will stop for a famous Malasada at Tex’s Drive Inn before venturing out to the overlook above the historic Waipio Valley at the end of the Hamakua Heritage Corridor. Peer out over “The Valley of the Kings” before we continue along the coast. Take a cool dip from our beachside hotel in the seaside town of Hilo, on the lush, windward side of the isle. Try the fresh ono or local Opakapaka at Café Pesto. You will be powered by Macadamia nut pancakes this morning from Ken’s House of Pancakes in Hilo from where we begin our journey to the remote corner of the island called the Puna district. 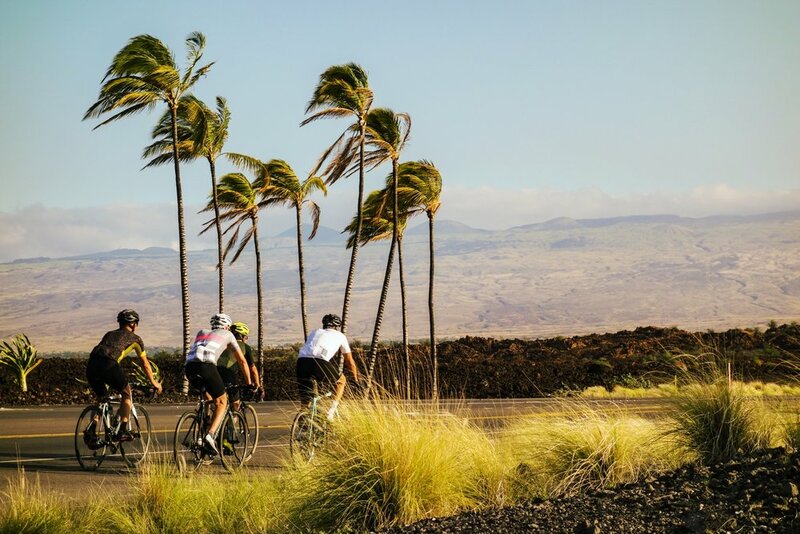 Known for the most recent lava flows, the hippie colony of Pahoa and the rugged coastline, the riding in this stunning region delivers! We will soak in an ocean front salt water hot pool before we begin our 4,000 ft. climb up to the Volcano Village. Like so many hidden spots around Hawaii this fairytale road will bring us to one of the only towering Koa forest, many of the trees are 200+ years old and are uniquely Hawaiian. These trees are found nowhere else in the world but Hawaii. Enjoy the descent and spend some time cycling inside the park, peering out over the active volcanic craters. Dinner is on your own this evening. A long day is in store for us today, all the way to Kona. As we depart from the volcano we begin our long gradual descent on Hwy 11, passing through the Kaʻū Desert on the southernmost district of the Big Island. Made up of mostly dried lava remnants and volcanic ash, this desolate descent sees us hitting the black sandy beach at Punalu’u where the endangered Hawaiian green sea turtles bask in the sun and swim in the waves. We have the chance to witness these stunning creatures before beginning our rolling ride through Naalehu, the Southern-most town in the US. From here we pass through the hillside Kona coffee plantations above Captain Cook. One last rapid descent towards the calm and clear waters of the historic town of Kona. 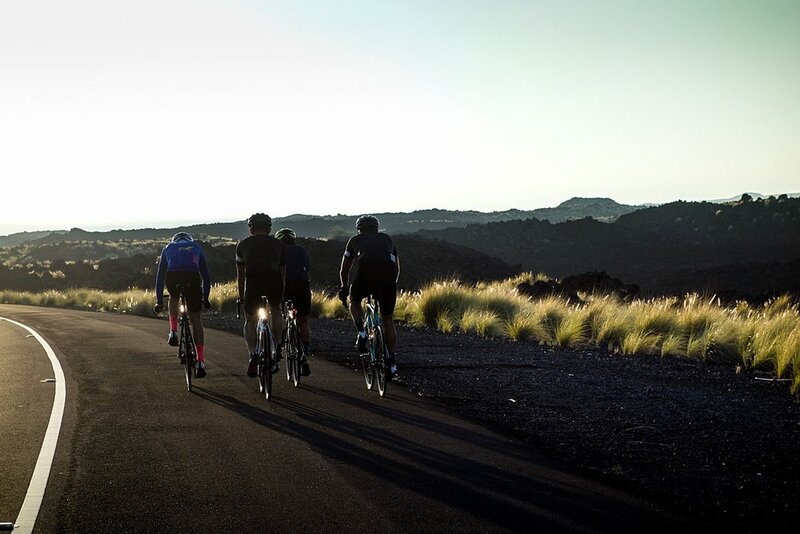 On our last day, you may just want to attempt one of the hardest climbs on the island, known as Koloko, a little-known brute out of Kona, with serious pitches and 10 brutal switchbacks, this is an incredible challenge for the advanced rider-of course this climb is optional. 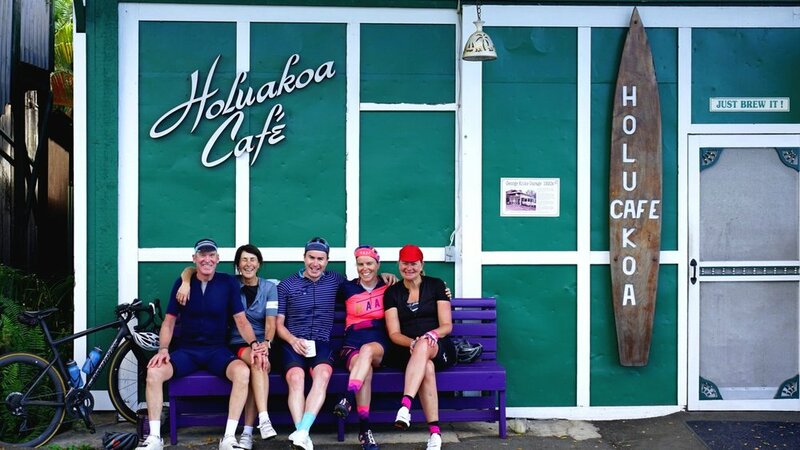 We then ride through upcountry Kona through the coffee plantations, stop in for a Kona coffee before we dip down to the sea and visit the Pu’uhonue O’Honaunau historical park before we enter Captain Cook and a beach side lunch of fresh tuna poke straight from the sea! A short climb brings us back towards Kona. For our celebratory dinner tonight, we will dine at the remarkable Holuakoa Gardens, a slow-food restaurant with seasonal menu, it is among the best on the island.